Product #557 | SKU XP-DSLR-C | 0.0 (no ratings yet) Thanks for your rating! The Switronix XP-DSLR-C is an external power tap designed specifically for both the Canon 5D and 7D DSLR cameras. 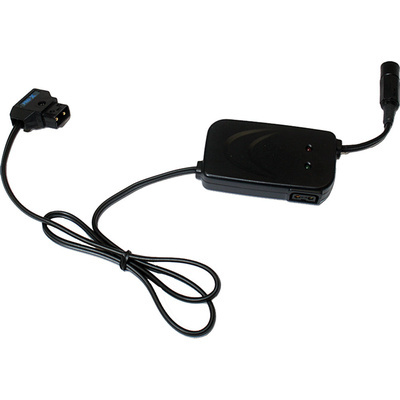 A PRO-X series Lithium-ion battery (purchased separately) or connected Switronix accessory provides ample power over long periods of time, especially when used in video mode. The cable features a regulated 7.2v connector jack for the OEM Canon 5D/7D Canon DC Coupler DR-E6 Camera with an inline female P-Tap connector for 12vdc, housed in an enclosure. Also includes both red and green LED indication to display status of battery power. The XP model cables can be used in association with a Switronix accessory or used solo with a PRO-X series Lithium-ion battery product. Includes both red and green LED indication to display status of battery power.